Sid’s carpet has the same pattern as the carpet in the Overlook Hotel from The Shining. The scene in The Incredibles when the cop busts Mr. Incredible and Frozone in the jewelry shop references the scene where Zeus Carver is held up by the police in Die Hard with a Vengeance. Maui in Moana (voiced by Dwayne Johnson) does the Rock’s “pec pop of love” like he did in Journey 2: The Mysterious Island. In Hercules, you can see Herc, Phil, and Pegasus during the training montage strike the same pose that Mr. Miyagi does on the beach in The Karate Kid. In Mulan, when the men in the fireworks tower ask Mushu who he is, he responds the same way that Rambo does in Rambo III. Toy Story 2 has a scene shot just like Jurassic Park when the T-Rex chases after the car. In Up, Paradise Falls looks nearly identical to the fictional landscape of the 1925 movie The Lost World. The mannerisms and look of Mr. Big in Zootopia mimic that of the famous Vito Corleone in The Godfather. Henry Limpet in his fish form from The Incredible Mr. Limpet can be seen in the “Under the Sea” sequence of The Little Mermaid. The shot where the monsters come out onto the scare floor in Monster’s, Inc. mimics a scene in The Right Stuff. 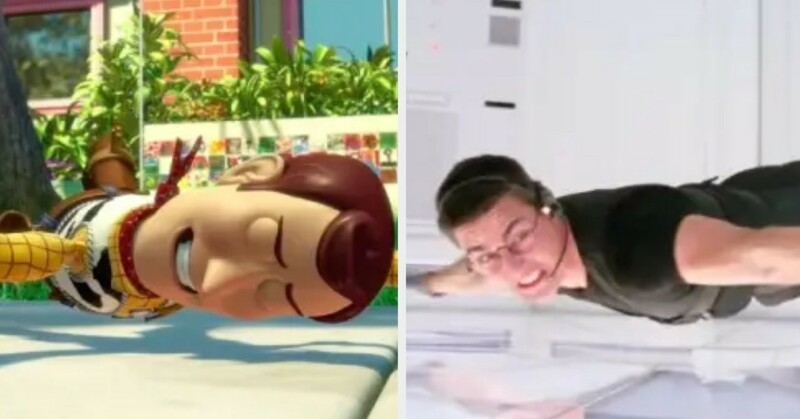 Woody draws inspiration from Mission Impossible‘s Ethan Hunt when he escapes Sunnyside in Toy Story 3. Flynn Rider grabs Rapunzel’s frying pan when the dam breaks in Tangled à la Indiana Jones and the Temple of Doom. The opening sequence of Beauty and the Beast, “Belle,” very closely resembles the choreography of the song “Mr. Crane” from the early Disney move The Adventures of Ichabod and Mr. Toad. King Candy in Wreck-It Ralph quotes the Joker in Batman. Despite their glasses, the characters in both movies still get beat up. The design of Auto in Wall-E was taken from Hal 9000, a character in Stanley Kubrick’s 2001: A Space Odyssey. Finding Nemo spoofed the “Here’s Johnny” scene from The Shining with Bruce. The Duke of Weselton’s dance in Frozen that he claims is “like a chicken with the face of a monkey” is the same dance move that Lindsay Bluth uses to imitate a chicken in Arrested Development. Zootopia spoofs Breaking Bad for the night howler scene, and it even goes so far as to name two of the characters involved (Woolter and Jesse) after Breaking Bad‘s main characters. 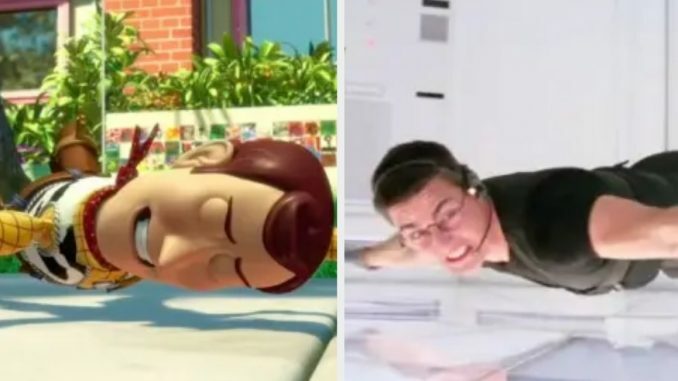 When all of the toys stand up to Sid in Toy Story, Woody’s head turns in the same fashion as The Exorcist. In Cars, the sheriff of Radiator Springs asks Lightning McQueen to repave a road as punishment. Paul Newman (who played Doc Hudson in Cars) was also tasked with paving a road when he played the title character in Cool Hand Luke 39 years earlier. The “help me” scene in The Fly is spoofed at the beginning of The Emperor’s New Groove. And Flynn Rider quotes Will Smith’s character in Independence Day when he wields a frying pan for the first time. Know of any other cool Disney movie facts? Share with the class in the comments below!